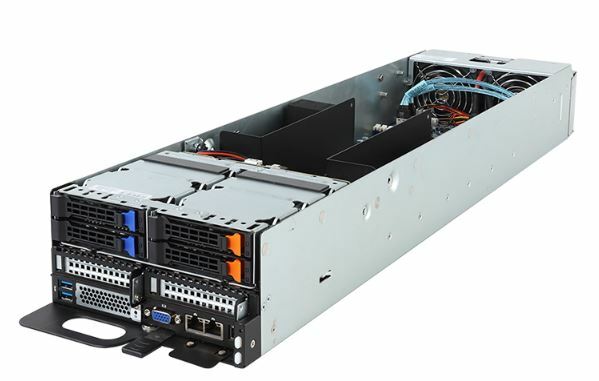 The new Gigabyte Racklution-OP TO22-Z61 and TO22-Z62 OCP nodes are unique in that they feature AMD EPYC “Naples” generation CPUs. That is a big deal. Many of the early OCP nodes were focused on Intel platforms. Indeed, the Gigabyte RACKLUTION-OP range and subsequent launches, have been focused on Intel Xeon. The new OCP nodes provide hyperscale data centers and those who are moving in the direction of OCP, to utilize AMD EPYC. Both new nodes are 2OU designs and feature dual AMD EPYC 7000 series CPUs. Each node is designed for 8 DIMMs per CPU and 16 DIMMs total. The Gigabyte TO22-Z62 is the OCP node the company has for AMD EPYC based NVMe storage. Indeed, the company is utilizing the platform’s expansive PCIe capabilities. There are two PCIe x16 expansion slots as well as an OCP mezzanine x16 slot. Further, there are four front bays which can be configured with either NVMe or as SAS/ SATA bays. One can also see that there are four top-mounted internal U.2 NVMe SSD bays. That brings the total number of U.2 bays to eight. Each node is designed to fit into the company’s 2OU 3 node chassis which means one can have up to 192 cores, 384 threads, 6TB of RAM, 24x NVMe SSDs per 2OU with the AMD Naples generation of CPUs. For those applications that do not need heavy NVMe storage and instead focus on compute, the Gigabyte TO22-Z61 is a fairly standard AMD EPYC compute node. Each node features two AMD EPYC CPUs and 16 DIMMs per node (8 per CPU.) Unlike the TO22-Z62, the TO22-Z61 does not have top mounted storage. Instead, it has four front hot-swap bays which can be used as two U.2 NVMe plus two SATA/ SAS or as four SATA/ SAS bays. One can see that the AMD EPYC socket is so large that the socket plus DIMMs fill almost the entire width of the 1/3 width 2OU node. Depending on your deployment scenario, you may prefer to have less in-node storage which makes the Gigabyte TO22-Z61 more appropriate for that deployment scenario. Along with these nodes, Gigabyte has trays to allow them to work in either OCP Version 1.0 or 2.0 racks. The OCP Version 1.0 tray is the Gigabyte TO20-BT1 and the OCP Version 2.0 is the Gigabyte T021-BT0. For those that are not familiar with the OCP Version 1.0 or 2.0 rack differences, a lot of it comes down to power distribution. The OCP Version 1.0 racks have three bus-bars that feed power from centralized power supplies to nodes. OPC Verison 2.0 racks have a single bus bar. The OCP Version 1.0 design has more power capacity for higher-power applications. Gigabyte has been pushing innovative designs lately on a number of fronts. The company has been willing and indeed forging ahead almost agnostic to CPU architecture which aligns to how hyper-scalers view the world. 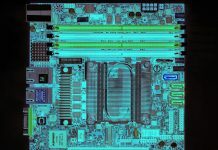 We saw Gigabyte adopt Cavium ThunderX2 and Annapurna Labs (the parent of the AWS Graviton Arm CPU.) Now we have AMD EPYC based OCP compute nodes. 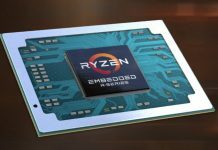 If you contrast this to a company like Quanta, where Quanta is only willing to talk about its Intel work and abhors even our covering anything but their Intel servers, Gigabyte is significantly more forward-looking and open to new technology. On a recent trip to Taipei, I visited one of Gigabyte’s labs where they have an entire free cooling OCP lab set up next to a similar lab for standard 19″ racks. 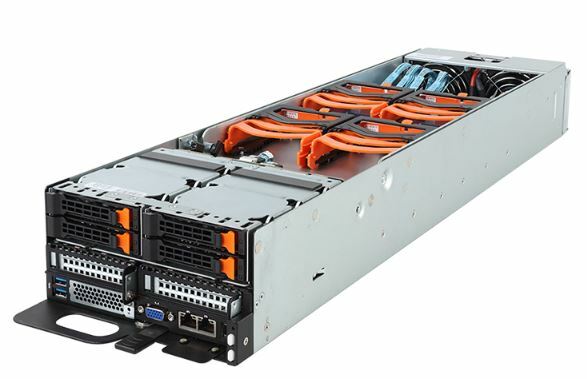 Gigabyte is making major strides in the OCP space and these AMD EPYC 7000 Racklution-OP nodes are an example of the company’s desire to lead in this space.